Worried about your credit rating? 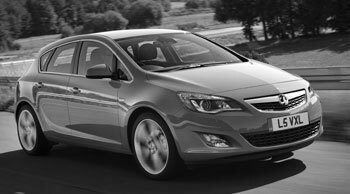 Our ‘bad credit car finance' experts have provided car finance to over 130,000 people who, just like you, have struggled getting approved elsewhere. Want a motorbike but need finance? 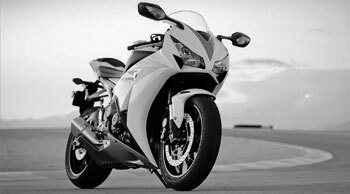 First Response are one of a small number of finance companies who are happy to supply bike finance to those who have struggled with bad or poor credit. Interested in getting van finance? 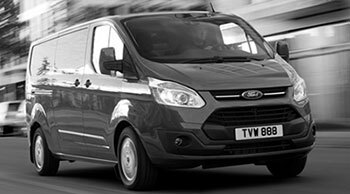 Need a new or used van for your business needs? Our relationships with dealerships across the UK could help you find the one you’ve been looking for. 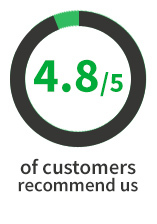 We put customers at the heart of everything that we do; helping you, our customer, as much as we can before, during and after your agreement will make us stand out from the competition. We don’t think like most finance companies and we don’t want to. Our unique way of thinking and doing business is one of the reasons we were voted Car Dealer Magazine’s “Sub-Prime Finance Provider of the Year” 2016, 2017 & 2018. Our excellent customer service means we're also rated as the UK’s favourite car finance company (lender) on Review Centre under the category ‘car loans’. To top that, we've won the Feefo Gold Trusted Service Award two years running. At First Response Finance we understand that getting approved for finance once you have your heart set on a car can be stressful and time consuming at the least. In order to minimise this, we suggest that you apply for pre-approval before you search for your car. This way you will have an idea of the maximum amount you can get to finance a vehicle, meaning you can chose you dream car with piece of mind and a clear idea of budget. Doubts about getting credit? Don’t worry, First Response Finance is a ‘sub-prime’ lender, meaning we specialise in helping people who have a history of poor credit. Make sure you read our application do's and don’ts to ensure you have all of your information ready. 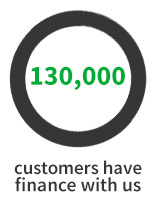 The product we offer is Hire Purchase which is one of the most popular ways to finance a vehicle within the UK. 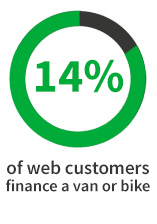 Whether you’re looking for van finance for your personal or business needs, bike finance for weekend riding or looking for a much needed car, our vehicle finance product could help you.